Micro-Epsilon has launched a world first in laser triangulation sensor technology with its innovative Blue Laser Sensor. The new sensor offers significant benefits for users who need to measure the position or displacement of red-hot glowing metals and also translucent targets. 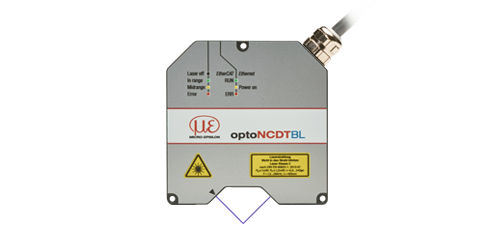 Micro-Epsilon’s optoNCDT 1700BL series of Blue Laser Sensors operate on the laser triangulation measuring principle and use blue (violet) laser technology. The sensors are ideal for measurements on hot, glowing metals, particularly in hot steel processing applications, as well as for measuring organic materials such as skin, foodstuffs, plastics, veneers and wood. Specifically designed custom optics and new, intelligent laser control and evaluation algorithms enable the blue laser sensors to measure red glowing metals up to 1,600 deg C, silicon up to 1,150 deg C with no loss in measurement specification. In addition, there are significant benefits to be seen when measuring against translucent objects such as organic materials, paper, some plastics and wood veneers. Unlike a red laser, the blue laser light does not penetrate into the measuring object because it has a lower intensity laser spot and therefore offers more stable, precise measurements on targets that conventional red laser sensors have difficulty measuring. 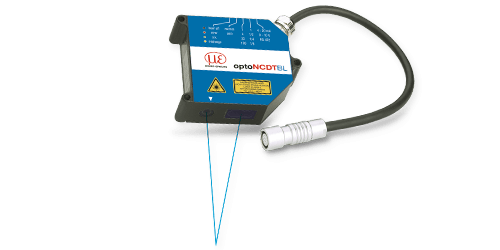 The optoNCDT 2300BL Blue Laser Sensors have been designed specifically for applications where conventional red laser diode sensors have difficulty measuring. These include measurements against shiny, highly polished metals, red-hot glowing metals and silicon based materials. In addition, there are significant benefits to be seen when measuring against translucent objects such as organic materials, paper, some plastics and wood veneers. Unlike a red laser, the blue laser light does not penetrate into the measuring object, which gives more stable and precise measurements. 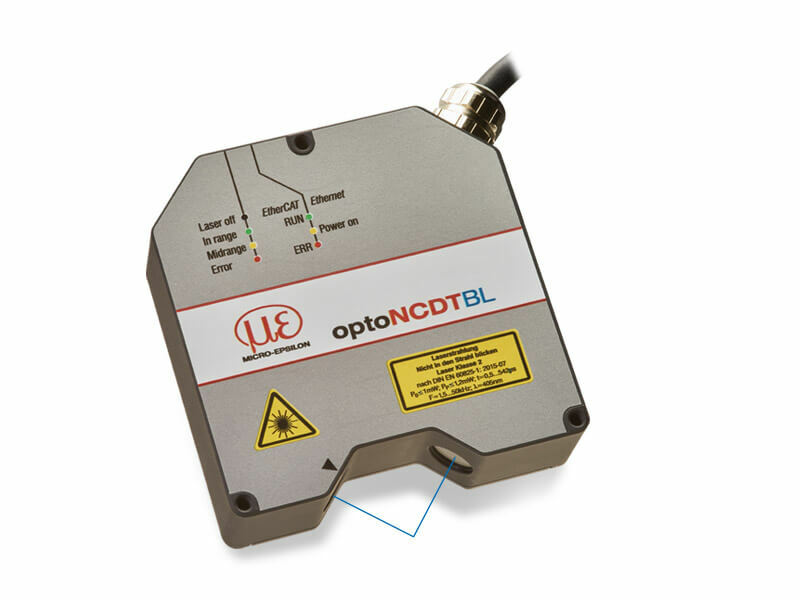 The optoNCDT 2300-2DR (Direct Reflection) high precision laser triangulation sensor is designed for measurements on highly polished, reflective, shiny and mirrored targets with a resolution down to 30nm. An extremely small laser spot size of 8.5 x 11μm enables reliable measurements against very small objects. The sensor is also ideal for both distance and thickness measurement of transparent targets such as optical glass. 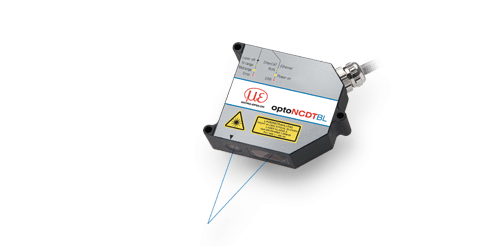 Unlike conventional laser triangulation sensors, the optoNCDT2300-2DR blue laser light operates in direct reflection (rather than diffuse reflection). However the design of the housing is like a conventional laser sensor which means the sensor body can be mounted parallel to the measurement object, which greatly simplifies the installation process. Due to the shorter wavelength blue laser diode, the measurement signal is extremely stable, which means the sensor is able to measure to nanometre resolution. The shorter wavelength also means there is less speckling on the CCD line, providing higher stability and accuracy. The system is configured via an integrated web browser that is addressed via an Ethernet interface. This interface enables the user to make settings for the processing of measured values and signals, e.g. peak selection, filtering and scaling the measurement range. Data can also be output over this interface which greatly simplifies setup, configuration and diagnostics.